This document is a Workbook, find more about workbooks' installation requirements here. This workbook explains how to set up a polling service tracking events occurring on a Smart Contract. In the Ethereum environment, functions don't return anything. In order to compensate for that limitation, Solidity offers a way to log state changes which is called Event. The following explains how to track events using Nethereum. Start a Geth chain ( geth-clique-linux_ geth-clique-windows geth-clique-mac) using startgeth.bat (Windows) or startgeth.sh (Mac/Linux). The chain is setup with the Proof of Authority consensus and will start the mining process immediately. 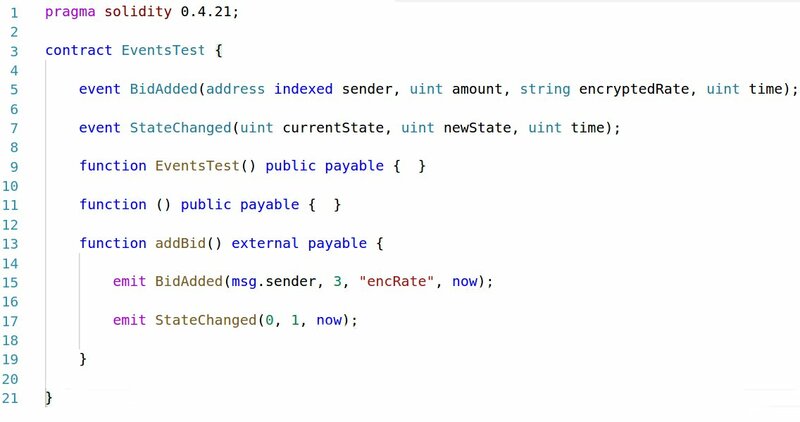 In order to deploy your Smart Contract, you will need first to compile it (using the VS Code’s “Solidity” extension, for instance), and declare your ABI and ByteCode in your CSharp class from the compilation output. ps: VS Code’s “Solidity” extension allows you to code generate those classes. You are now ready to deploy your contract, using the DeployContract method and the compiled versions of your contract as payload. Using the “contract address” parameter returned by the transactionReceipt, you can now declare a contract variable that points to an instance of a contract object. It's now possible to call functions within your contract using the GetFunction method. Before calling an Ethereum function, it’s good practice to evaluate the gas cost incurred by the call by using the EstimateGasAsync method. Finally, you can call your function, the transaction receipt will return information regarding the transaction that was sent. Calling a contract function on Ethereum won’t return the result. But you can use events to log state changes or function call results. In the case of our example, you can select the event “BidAdded” by calling the contract function GetEvent. Event logs can be filtered for a specific block range or topics, in the example we are creating a filter that will return all the event logs for our recently deployed smart contract from the BlockNumber of adding the bid to the latest.